Traditionally, lead generation for recruiters has been straightforward. If you wanted to build a client base, you picked up the phone and cold called. The person who could make the most calls with the best script won. But as the world has changed, the effectiveness of this lead generation method has slowly declined. Everyone screens their calls. People prefer communication over email and text. Getting someone to return a voicemail is almost impossible. And while there is obviously still a place for cold calling, the world of recruitments knows that it needs new lead generation ideas. That’s where online lead generation for recruiters enters the picture. The online opportunities for recruiters are plentiful but confusing. That’s why I want to break them down so you can figure out what’s best for your recruitment agency. In this article, we’ll walk you through the various lead generation tools at the recruiter’s disposal (paid advertising, SEO, social and email marketing) and discuss their pros and cons. The allure of Google Ads is obvious. By only displaying ads when people’s searches match a list of keywords that you provided to Google, you should be targeting only people with a high buying intent – the people who are directly interested in hiring a recruiter. Google Ads is not only the quickest way to find client leads but also the fastest way to blow a massive hole in your marketing budget. The Google Ads space in recruiting can be competitive, driving up the cost-per-click (CPC) to $10 or even $15. And Google Ads is often a lot more complex than it appears. In order to run a profitable campaign that your recruitment agency that generates leads, you need to have a highly optimized set of keywords, ads and landing pages. While Google encourages people to dive right in and set up a campaign on their own, I would recommend leaving this lead generation tool to the professionals. Unlike every other ad platform, Google Ads can target ads towards people based on their needs at the exact moment of their search. This ensures that you only display ads to people that have a high buying intent. Ads can be customized to match a person’s exact search, increasing the odds that the ad is clicked. 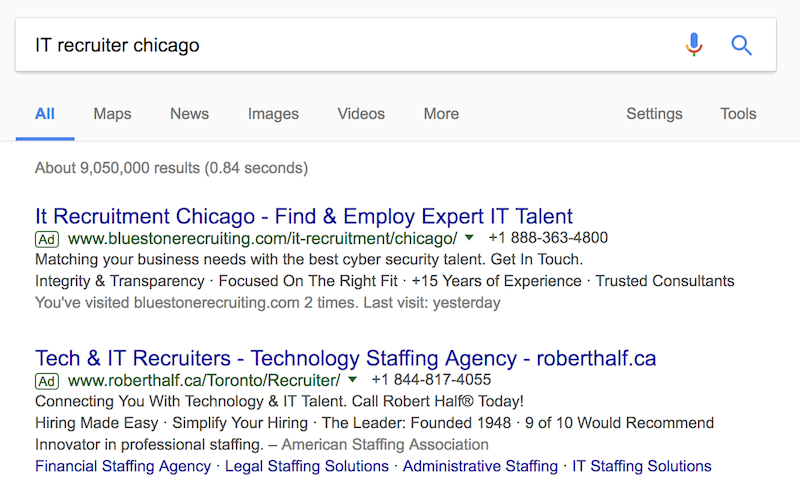 For example, if someone searches for “Chicago IT recruiter”, you can swap their search query into an ad headline so that the ad reads something like “Chicago IT recruiter – Your recruiting specialists”. If you are not careful, Google’s default settings will cause you to blow through hundreds or thousands of dollars before you figure out what you’re doing wrong. In some regions and industries, the CPC can be high, making it difficult to run a profitable campaign. Social media advertising is quite popular these days and for good reason. The ability to target your audience directly in their feed based on precise demographic criteria is a handy tool in the advertiser’s arsenal. 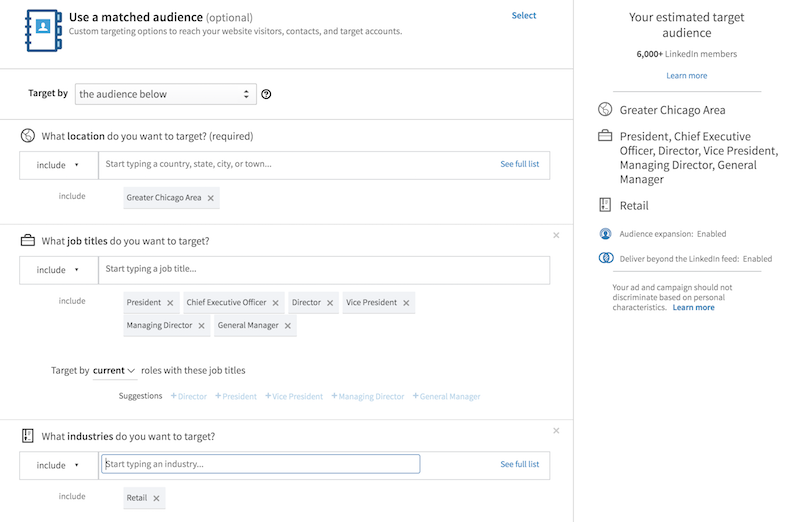 While each platform offers slightly different targeting preferences based on the demographic data they have available, LinkedIn is the obvious choice for recruiters trying to find new clients or candidates. In the example above, we can see how a Chicago-based recruiter specializing in executive search for the retail industry can quickly find 6000+ LinkedIn members to target with an ad that is personalized to them. However, much like AdWords, social media advertising for recruitment lead generation has its challenges. Demographic-based targeting can make it difficult to get in front of a potential new client or candidate at the exact moment when they actually care about the recruiting service you’re offering. It’s therefore important to create an ad campaign that is so compelling that someone is willing to click it even when they’re not in the precisely right spot in your buying cycle. Demographic targeting allows you to hone in on your specific audience with relative ease. To make things even better, retargeting ensures that you get the people who expressed some interest in your brand to come back to your site. Facebook’s demographic data is far richer than other platforms and if you get creative, you can target people at a more granular level than you might even imagine. Even if you know that a person is in charge of hiring decisions at the exact type of company you’re targeting, it’s not always easy to get an ad in front of them at the precise moment they are hiring. It can be difficult to spend $25-$100 per day on an ad campaign if you have a limited budget, especially when you cannot be certain exactly how long it will take to refine the campaign and make it profitable. Banner ads have been around since the beginning of the Internet and for good reason. When used judiciously, they can be a highly effective means of targeting the decision-makers at firms for which you want to recruit. However, much like other forms of paid advertisings, they have their drawbacks. Banners ads are so prevalent that many people have developed ad blindness, a term referring to the state where people ignore ads prior to even focusing their attention on them. Also, it is not always as easy to target people demographically with banner ads. It’s therefore critical that you think long and hard about your targeting strategy before you start paying for banner ads as part of a recruitment lead generation strategy. Banner ads can be a cheap and quick way to experiment with the paid ad game. You can target people in a specific industry by placing ads in industry-specific magazines. For example, a healthcare recruiter that wants to get in touch with decision-makers could advertise in publications such as Healthcare Informatics or HealthData Management. If you advertise in a display network such the Google Display Network, you need to be very careful with your targeting criteria or you will end up showing ads to irrelevant audiences. Ad blockers such as AdBlock are so prevalent that some people will never see your ads, regardless of the ad platform you use. SEO is the practice of optimizing your website so that you rank highly for search queries relevant to your business. If you can achieve your objectives with this lead generation tactic, you are pretty much set as you watch Google funnel free traffic to your site on a daily basis. 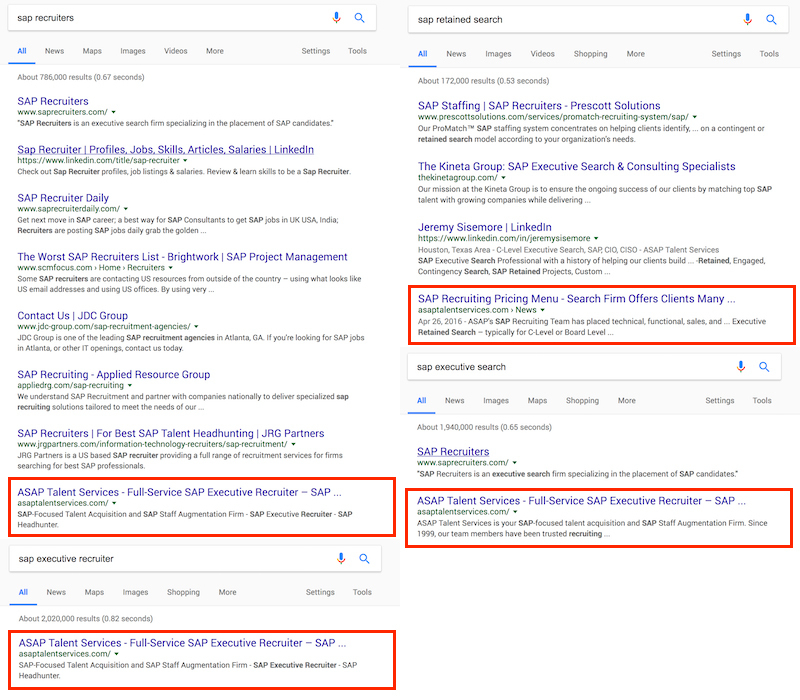 Guess who gets a lot of search traffic in the SAP recruiting market? To get your site to rank for important keywords, there is typically a large upfront commitment in time, money or both. But if you’re ready, you need to think about two components of SEO: on-page and off-page. On-page SEO is the process of optimizing the site structure and individual pages of your recruiter site to maximize search traffic. The great part about on-page SEO is that it is typically a task you can do entirely on your own as part of a self-directed recruitment lead generation strategy. Backlinko’s on-page SEO guide is a great resource to review when you are first getting started. Off-page SEO is essentially another name for link building – getting other sites to link to your site. While it is nice when sites give you a natural link because you have such good content, you will find that it is much more likely that people will link to you if you engage in deliberate link-building activities. These can include guest posting on other sites and asking influencers to share your content. Once you start to rank for organic keywords, you can get a significant amount of traffic to your site without any additional cost. When a potential client finds you via search, you gain the recruitment seat of power, a position that you want to achieve in every negotiation. If you have a WordPress site, the Yoast SEO plugin provides a handy on-page SEO checklist for every page and post on your site. Optimizing your site for on-page SEO can take a lot of time, especially if you have a large number of old blog posts that you wrote without a clear search traffic intent in mind. Getting people to link to your site is costly, either in time or money. If you want to write guest posts for other sites that link back to you, you will need to come up with many blog posts ideas and then either write the posts yourself or pay someone to do it. If you want to generate content that is so good that a large number of other sites will link directly to it, you can expect to spend at least 50 hours or $1000 per piece of content. For example, our Tools For Recruiters post, which has received a large number of links, took about 70 hours to complete. The promises of social media marketers who say that you can build your business without spending a dime are lofty but as with all marketing channels, the reality is a bit murkier. Social media marketing is the process of publishing content on LinkedIn, Facebook and Twitter to reach your target audience. The challenges of turning social media into a legitimate lead generation tool are significant. They include a declining organic reach, the difficulty of finding an audience that cares about what you’re posting and the time-consuming nature of sharing content. We’ve already talked about how you can save yourself some time by automating the sharing process but there is not much you can do about the organic reach problem. As social media platforms continue to grow, they are increasingly showing business-related content on behalf of their paying advertisers only. If you can figure out how to build a large following, you have a free source of traffic on your hand. LinkedIn is a natural social media platform for recruiters so it makes sense to spend some time on the site regardless of your primary marketing approach. Publishing content to the 1000 people who have liked your page on Facebook but knowing that it will only be seen by 50 of them can be discouraging – and the problem is only likely to get worse as organic reach continues to decline. Many people don’t like to mix work and leisure and won’t read content that relates to their job while they are browsing social media for pleasure. Email marketing as a recruitment lead generation tactic can be a goldmine for businesses that have a large email list. In fact, email is the only free lead generation option that is guaranteed to get your message in front of your audience. When thinking about email marketing, you must remember one fact: people delete most of the emails they subscribe to without opening them so you better have an eye-catching subject and engaging content if you expect your subscribers to get excited when they see your email in their inbox. (We wrote about how you can do that in a previous post). It’s rare to find something in life that is free and valuable but when done right, email marketing falls into that category. Once you hit upon an email marketing concept that works, you can often spend as little as an hour per week setting up your newsletter. If you have a large list, free email marketing is a bit more tricky. There are options like Sendy which are essentially free but more user-friendly tools tend to cost money. Most people want to save time and so they send out a single email to their entire list. Unfortunately, this is a terrible idea. While segmenting your list and sending out more personalized content is the way to go, it’s often quite time-consuming to set up and execute. 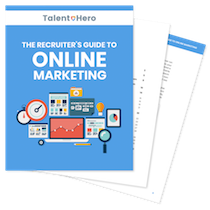 As a recruiter, you are probably not used to marketing your business very much at all. While relying on direct sales tactics like cold calling certainly has its upside, there is definitely room to expand your horizons and try out various lead generation tactics for recruiters. But remember, before you get started, make sure you understand what you’re getting yourself into and choose the channel that makes the most sense for your business.